Millenials can take a step back in time and savor the memories in just three places in the United States. In a report at Canada.com, it has been revealed that just two McDonald’s locations in the country serve what has become a token of failed marketing. 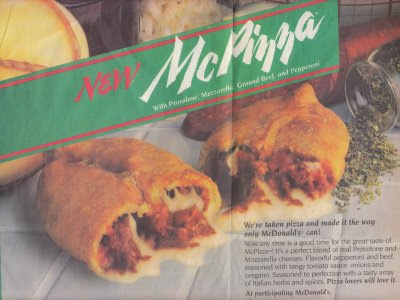 Children of the Nineties: behold McPizza. McDonald’s pizza is available in Florida Ohio and West Virginia, allowing children of the Nineties to get back in touch with era of Monica Lewinsky, Beanie Babies, Furby and Tickle Me Elmo, by biting into a McPizza and its cheesy sweet marinara goodness. McDonald’s featured the McPizza in an effort to capitalize on dinnertime business and to recuperate lost market share to Domino’s pizza as the taste for hamburgers dwindled. The chain even went so far as to turn its iconic golden arches on their side in order to make the Zs in pizza. Despite shelling out millions in allegedly patented pizza ovens, McDonald’s foray into pizza-making did not meet with success. The ovens needed 11 minutes to warm up and produce a pizza, thus disappointing customers who were accustomed to getting their food almost immediately. Following its launch in 1996, McPizza died by 2000. McDonald's offered a pizza product that resembled their apple pie turnovers, in addition to the traditional rounds. But pizza is still on the menu at the McDonald’s in Orlando (FL) Pomeroy (Ohio) and Spencer (W.Virginia), hours away from any sizeable metropolitan area. The "pizza you won't believa" is still being produced at both locations, and with ingredients from sources that are still unknown. McDonald’s ceased the distribution of the pizza ingredients more than a decade ago, so the current pizza-masters have had to come up for suppliers on their own. Sitting near the border with West Virginia and on the banks of the Ohio River, Pomeroy has a population of just 1,852, according to the 2010 national census. And Spencer (West Virginia) is just a little bigger, at 2,352 people according to the same census. The amount of pizza sold varies from day to day but remains steady. In Orlando, pizza is just part of the menu available at the largest playstation in the entire McDonald's chain. A personal pizza will set you back just $6, while a large meat pizza sells for $11. Additional toppings go for 75 cents each. According to a helpful employee who went by the name of Mario, the location at 6875 Sand Lake Road near DisneyWorld is the only location in Florida offering the cheesy treat.